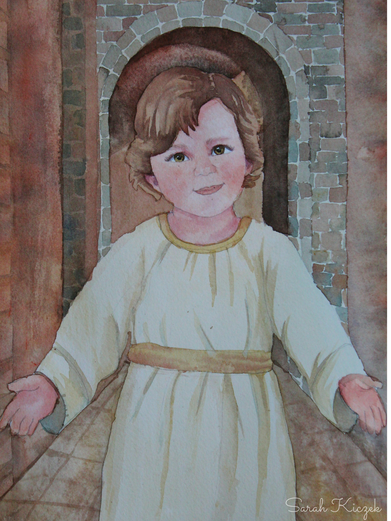 My devotion to the Divino Nino started around August 2009 when I watched a show, “Miracles of the Child Jesus” on EWTN by Bob and Penny Lord. They talked about Mother Angelica's devotion to the Child Jesus; her devotion inspired me to pray to Him. The first time, I prayed to Him was when the heat for my tenant was broken, we did not have enough money for repairs, and it was very cold. We called PSE&G because they would allow us to pay them later. I prayed to Divino Nino to help us and I promised to spread devotion to Him and give a statue of Him to my tenant if he answered my prayer. The technician came, and after trying to figure out the problem he went up the stairs, and he miraculously stumbled on the cut cable that connected the thermostat, he reattached it and we have not had any problems since then. Not only was it fixed easily, the technician did not even charge us a penny. Our next prayer request to Divino Nino was a newer car for our family as the one we had was breaking down on the highway so many times, we had exhausted our AAA towing. We promised a statue of Divino Nino to a priest friend of ours if Divino Nino answered our prayer of fixing our car. Well, our car broke down six times, and after that, we decided to sell it, and we decided to praise Divino Nino in the “storm” since now we had no car and not enough money to buy one. We bought the statue anyway because I felt that we had to praise Him no matter what, little did I know the plans He had for us. During Christmas, I was talking to a friend about how our cars were breaking down, and with inspiration from the Holy Spirit, I told her that I was going to pray to the Child Jesus to get us both newer cars. An idea came to me, I would ask a dealer to donate a car for my tenant, but I did not know where to start or where to go, and I did not have a car either, all I knew was that the dealer had to be a family owned business. The first thing we needed to do was to get a car for ourselves, and our first try was a disaster. We went to a dealer close to our home, and we spent four hours trying to get a car that we thought might work for our family. At the end the price changed, it turned out to be much more expensive than what we were told originally, so we walked out without a car. On the way home, it came to me that I had forgotten to pray to Divino Nino, so I decided that next time, I would bring the statue I had with me to buy a car and make sure I prayed to Him before going. So, a week later we went to a second dealer, and I brought the statue with us. While there, I realized that I had found the perfect dealer (family owned business) to ask for a car for my friend. When I was waiting for the paper work, I knew it was the dealer I had been looking for, I was nervous, but I knew it was now or never. I prayed for courage. I asked the owner with tears in my eyes because I could not stop them from coming, for the car for my friend. The owner said yes, and I gave him my statue of Divino Nino, and I promised him that I would pray for him, for his family and his business for the rest of my life as a thank you for his generosity. Well, within two weeks my friend had a working car, and the owner of the car dealer sent us a card where he told us that we had changed his life completely. Almost seven years later we went back to him for another car and the whole dealership looked so different and he looked younger and much happier than we saw him the first time. His life was truly changed and he remembered me like we were family. Another time Divino Nino helped us, my sister in law was losing her teeth for no known reason and needed a dentist to help repair her teeth. She had no money and was in dire need and pain. I told her we would pray for her to Divino Nino and look for a dentist who might be able to help. Thanks to Divino Nino she found a dentist the very next day who helped her for a minimal amount. One of my sisters was expecting her first child and was in her seven months when the doctor told her that her sonogram showed that the baby did not have enough amniotic fluid. She was very scared because it could mean that she would have to give birth to her son prematurely, but I told her that we should pray to Divino Nino and she was able to carry the baby to term, and he was born healthy. He is now eight years old and full of energy. In addition, we were having problems keeping up with our mortgage and prayed to Divino Nino to get a modification on our loan to make our payments affordable. We promised a sized church statue to Our Lady of Fatima in North Bergen NJ. Before our prayer was answered, we thanked Divino Nino ahead of time and gave the statue to the church. Four months later, we signed the contract for our modification which was due on the feast day of Divino Nino in Colombia, July 20, 2010. Also, we had a problem with our roof. Since we bought the house thirteen years ago, we knew the roof had to be replaced, but we never seemed to have enough money to replace it. When it leaked, we just patched it up. We tried to get a quote, but we did not have enough money to do it. Soon after we started praying, my tenant came and told me that she had two holes in the roof and that she could see the light through it. My husband and I knew at that moment that we needed a miracle to replace our roof, so we promised Divino Nino $100, and He came through for us with two loans, and now we have a brand new roof that should last for the rest of our lives. The House of Divino Nino website was created in thanksgiving for answered prayers and to help spread devotion. I want to spread devotion to the Little Child Jesus, “Divino Nino,” because He has been so good to my family, my friends, and me. He has been answering our prayers very quickly, and I truly believe that He would like His Infancy to be honored and praised. He revealed to Ven. Sister Margaret of the Blessed Sacrament, “Ask all that you desire through the merits of My Holy Infancy, nothing will be refused." I believe, we need the help of our Little Child Jesus, more than ever in our lives because of the kind of problems we are facing today throughout the world and especially in our country. It seems that there is very little devotion to Divino Nino in the United States. Since I started to pray to Him, He has answered all of my prayers. I love Him so much. It is in my heart to someday be able to build a shrine to Divino Nino; the name will be "The House of Divino Nino." This will be a place where we can all gather to praise Him and thank Him for all the blessings He has given to us and will shower upon us all. Praise be to Divino Nino forever and ever!